Spent the weekend in Atlanta and the lush green around me inspired me to throw together something bright and crisp. A touch of silver and an accent of lemon freshened it up and gives an early ode to the warm summer months. Can't wait for sun-kissed skin and lemonade! It's not too far away with Memorial Day right around the corner. I love the bright on brights look but I like to tone everything down with neutral accents when I can..in this case the silver lends itself as a neutral while also boosting the shine factor. 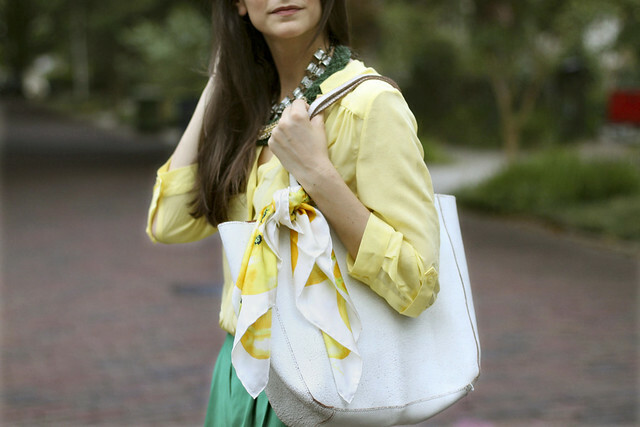 Check out more of my tips on mixing brights on my TJ Maxx trend web series if you'd like HERE!